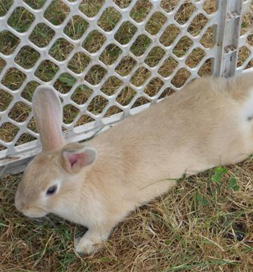 Happy Tail: A sweet rabbit finds a hoppy home. After the death of their beloved eight-year-old rabbit, Valerie Dorsey and her mom of Dayton, OR, were feeling heartsick, even though they had several cats and a dog. Together they decided to begin looking for the right person or place from whom or which to adopt, one that was conscientious about how the bunnies were treated and that the homes they were to go to were responsible. They looked at newspapers, Internet sites and private individuals, but eventually came to Petfinder and realized that it represented many rabbit rescues, making it an easy resource to use. Read this bunny tail in Valerie’s own words. They were particularly attracted to Phoebe’s Rabbit Haven, which seemed to live up to the values the Dorseys considered important. It was located in Salem, OR. One rabbit in particular caught their attention and held it. His name was Butterscotch. “Although all of the rabbits visited were divine,” Valerie says, “I still felt a connection to Butterscotch — his snuggles, his nose kisses, his energy, his good looks — everything!” And so the adoption was finalized. These days Butterscotch lives in a roomy indoor cage and gets daily “hop abouts,” according to Valerie, and then he is only too glad to snuggle on someone’s lap. It’s a love and happiness connection for the whole family. It sounds as if rabbits make good pets. Find out more.